Google has just started embedding rich transport data into their maps, allowing you to click on a transport stop (train station, bus stop, ferry berth, etc.) and see - depending on what information is available for that city - a link to the transit company's website (e.g. in Stuttgart), the services that stop there (e.g. in London), and even the next few departures (e.g. in Manchester or Zurich). The big G aren't the first to do this, but they are the first that I am aware of to embed information without making it obvious that it's there. Multimap has been allowing their users to overlay local businesses and POIs for quite some time. It perhaps wasn't the best integrated feature in their original site but with the release of their nice shiny new site, it is much better integrated, with the ability to turn on and off different layers of information. Unfortunately it doesn't quite go as far as upcoming departures, but with more and more local authorities providing this information in standard(ish) formats it's something that we could see more of on mapping sites in the future. Subtly introducing more and more rich information into maps without overburdening the user with information will be a great way forward for online mapping, and something that I'd love to see happening in OpenStreetMap as the database grows. 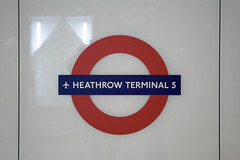 Whilst travelling back through London last week, I noticed this new sign showing the extension of the London Underground Piccadilly Line that will take passengers to the new Heathrow Terminal 5 that is being built. The only thing is, it's really confusing. If you were to look at that, how would you expect to get from the city to Terminal 5, considering trains appear to go straight from Terminal 4 to Terminals 1,2,3, bypassing T5 completely. If that's not going to confuse bewildered tourists, I don't know what will.